The chance to buy into a unique development at keen, city-centre prices. 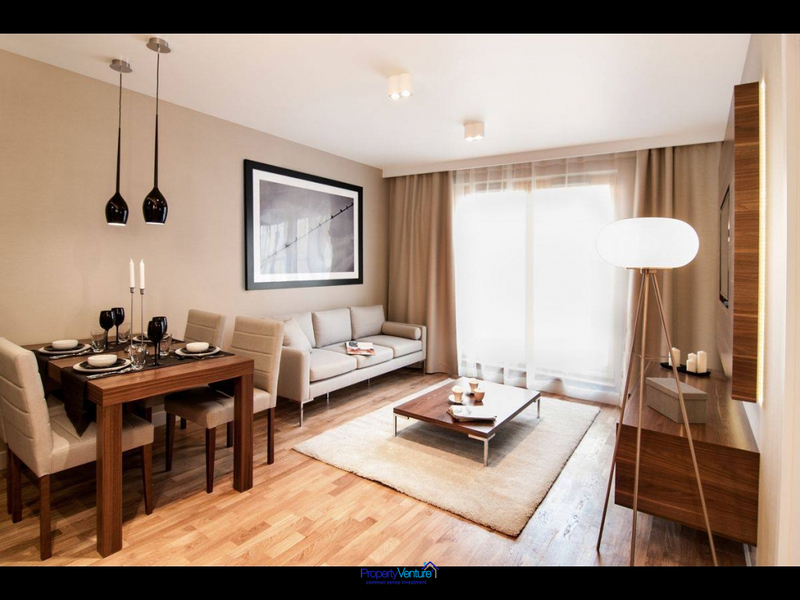 1 bed, approximately 60sqm starting at PLN 529,288 just under £100,000. Competitive prices for this central location, which combines a great investment with a fabulous, cultural, city lifestyle. Walking distance to the main square, the Rynek Glowny, where the markets take place. The Historic Brewery is being given a new lease of life and has become a vital part of the city again. The renovated complex comprises: apartments, offices, contemporary stores and business facilities, as well as restaurants and bars in the charming historic premises of the brewery. Residents of Cracow and tourists can admire the Palace and post-industrial buildings, dating back to the second half of the 19th century, in which wonderful beer was brewed for more than 100 years. 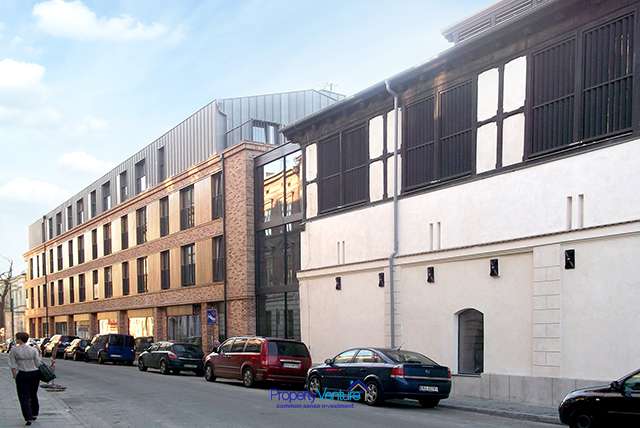 For those who are looking for an interesting and fairly unique angle on Krakow, this property development offers extraordinary cellars with huge ceilings. The entire quarter will be opened to the city and create an attractive and vital place for both leisure and work just several minutes walk from the Rynek the World-famous medieval Market Square, with its Christmas market and the Kleparz food market, as well as famous University Campuses like Jagiellonian. 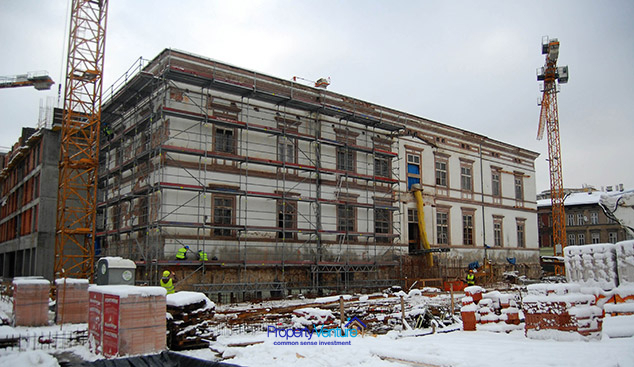 The historic buildings of the Brewery are renovated and adapted to their new function: the interior of the Palace is restored to its original elegance as high-class offices, the Engine Room and the Boiler Room are business premises as will the Malt House. Whilst the historic Palace provides high-class office space. Among the carefully-renovated 19th-century industrial buildings of historic value, there are 7 contemporary residential buildings with parking spaces and business premises on the ground floor. Residents will have their own small gardens (on the ground floor) or terraces (on the first storey). 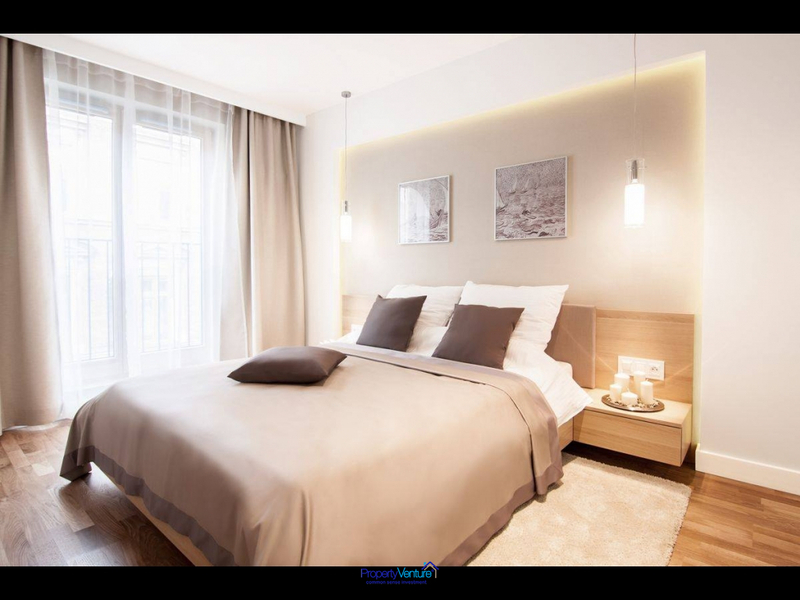 Apartments on the two highest storeys have been equipped with air-conditioning. A contrast between the present and the past gives this venture a unique character and makes it a part of the exceptional atmosphere of Krakow, a city where modernity and tradition co-exist in harmony. The entire residential part of the project is surrounded with eye-catching green areas with places for walks, as well as a playground for children. In the heart of the city The Old Brewery is situated only 800 meters from the Rynek (Market Square) and surrounding historic places of the Old Town. It will take only 20 minutes on foot to reach the royal Wawel Castle or the magical Kazimierz-Jewish Quarter. 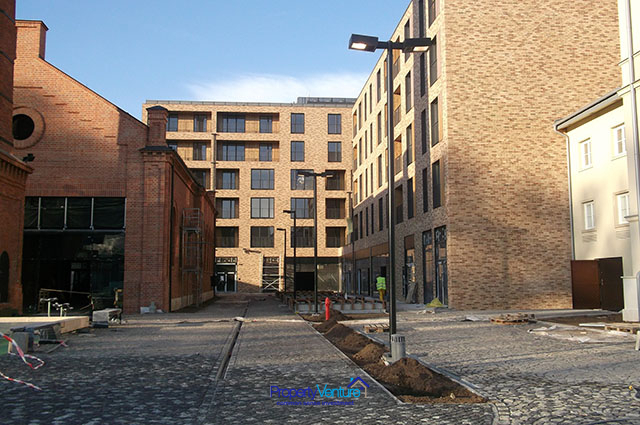 Both residents of and employees working in the Old Brewery, will have convenient access to the most important Krakow theatres, museums and colleges as well as restaurants, coffee shops and shopping malls. In the vicinity, there are hotels and the Main Railway Station (Dworzec Glówny) providing domestic railway services and a railway connection to the Balice international airport. The prices are for "black finish" which is usual in Poland, so for what most people expect as a "white finish" which is flooring and plastered walls a fitter completes this and it costs (for a medium-high finish) approx 1,000 PLN per sq m with kitchen costing approx 15,000 PLN additionally. So for a 60sqm apartment count on an extra £15,000.